TOMORROW NIGHT at Sole Sports Running Zone in Scottsdale! 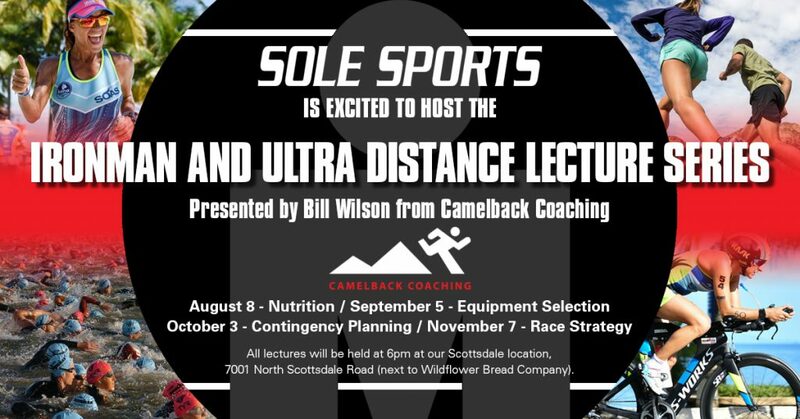 Please join us in Scottsdale at Sole Sports Running Zone on Wednesday, September 5, at 6pm, for the second lecture in the Ironman and Ultra Distance Lecture Series, EQUIPMENT SELECTION. You will be given valuable, non-biased information about gearing up for the swim, bike, and run, so you can make informed choices about your purchases, ensuring you have the correct equipment for the task. If you’re wondering whether to go with a full wetsuit or a sleeveless suit, a tri bike or road bike, or if you should be worried about the weight of your running shoes, then this is the lecture for you. The information applies to all triathletes, cyclists, and runners, whether you are racing long course or not. All are welcome and the lecture is free. As an added bonus, all lecture attendees will receive a special 15% discount on items purchased the nights of the lectures! This entry was posted in Equipment, Ironman on September 5, 2018 by tekgrl_admin.